at one end of the table we had Battle of Rorke's Drift & Battle of Kambula at the auther. Rorke's Drift was a 1:1 feg scale all of the terrain was scratch built. Aii of fegs were painted By Donald, Mal & Myself. 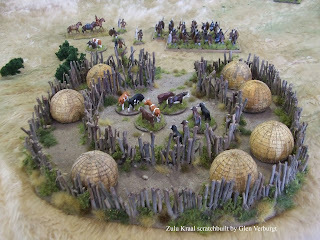 Can you give any details on the construction of the zulu huts? Certainly the best I've seen at this scale and I need some for my table. I planing to cast up some more for a frend if you would like to order some.